For all the legacy of Sonic Youth’s noise-laden, avant-garde beginnings and the continued examination of it through their later work, founding member Thurston Moore’s solo albums have always been a touch more pop leavened. 2007’s Trees Outside the Academy was even downright gorgeous in many spots, taking his music in softer directions than it had previously gone. But earlier this year Moore released the Suicide Notes for Acoustic Guitar EP, a slab of sonic noise that was pure feedback and static. It seemed out of line for his recent solo work, but the title became a clue for what was to come. 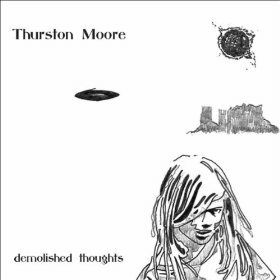 Demolished Thoughts finds Moore working almost exclusively across the record with acoustic instruments and the results are some of the most beautiful work of his career, with or without his bandmates. The album is also of a piece in a way his records haven’t always been. Musical themes get revisited across songs from front to back; not in ways that seem devoid of ideas, but in ways that seem to build upon one another. There’s very little, if any, percussion here and the album feels akin to some of the 70’s singer-songwriter focused albums by the likes of Tim Buckley. Not in sound so much as style – this is a songwriting focused record that builds an amazing mix of sounds in order to support the singing, not to overshadow it. Credit for the album’s whole-piece sound doesn’t go simply to Moore in this case though. Enter Beck, an artist whose reputation as a producer is slowly building following his work on Charlotte Gainsbourg’s 2010 album IRM. There’s no doubt that these are Thurston Moore songs—nothing else sounds like a guitar played by him, acoustic or electric – but whether it’s the prominent use of string sections on tracks like “Benediction” and “Orchard Street,” or the just-into-the-red levels of the guitars on “Circulation,” the production is as much a part of what makes the album work as the songs themselves. I purchased and loved this record. I do have a complaint/criticism and I’m not even sure if this is the correct forum but I haven’t found anyone else talking about this. Why do artists insist on releasing what should be an individual LP (2 sides) on 4 sides of vinyl. Both the new Fleet Foxes and Thurston Moore are 4 vinyl sides for 9 and 12 songs respectively. Whatever sonic quality is gained, the listener looses the flow of the record by constantly having to get up and flip the record after 2 songs. Not to mention the costs of extra packaging… Is there a reason for this? Does anyone else notice/care? @Dave – Not sure. I assume these records are done as 45s instead of 33? Is that how the audio quality is gained? If so, it may just come down to the limited market for vinyl and the thinking that it’s almost exclusively for “audio fetishists” at this point and so they go for that angle rather than the more expedient, pragmatic way of packaging. As much as vinyl has resurged in recent years due to the upswing of mp3 portability and the desire for more “authentic” and “warm” physical mediums, I still think it’s a niche market. Does anyone know – does this also explain why new vinyl is almost always ridiculously expensive?